In the heart of Philadelphia, Pennsylvania, USA, near its industrial Chinatown district, stands a broken building. Half of it is demolished and hauled away. On the wall that still stands, a faint outline remains of the structure of the house that was: two floors, a few rooms, a staircase. The stories of the house and the people who lived there are lost. History has been swept away in order to make room for progress. But for local graphic artist Ben Volta and his students it was an inviting canvas. 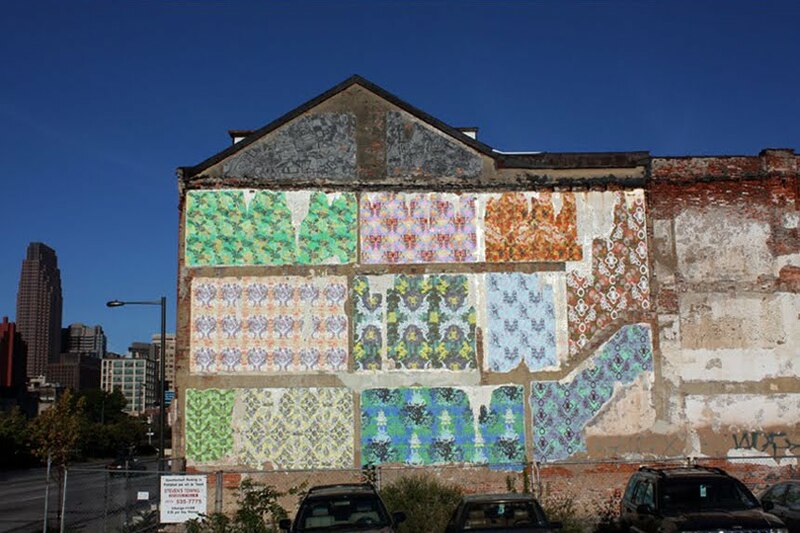 Through various projects Volta has become known in Philadelphia as an artist with a mission: bringing new life and beauty to bare, empty or forgotten spaces. He does not want to just ‘brighten things up,’ but to give the real character and story of the place a chance to shine through a conscious choice of colour and form. In this case Volta saw on the corner of 10th and Vine a beautiful chance to pay homage to a lost home by creating a story and mounting it on the wall. And so the artwork Home that Was was born. The subtitle of the work tells more about its goal: ‘Objects that fill a house on the walls of a house that no longer exists.’ In a brainstorm Volta and his students first decided what the character of the visible ‘rooms’ would be and then made drawings of the objects that would have filled those rooms: instruments for the music room, toys for the playroom, books for the library, toilet paper for the bathroom. Volta then used these drawings to create rich graphic designs for each room and printed the patterns on sturdy wallpaper. Ultimately twelve wallpapers were hung on the former interior wall of the ‘home that was’ and the story came to life. It is an unique work in several respects. First it brings a new spirit of life to an otherwise bleak environment. Passersby are not only reminded of the importance of beauty, but also of the fact that empty places often have a hidden or lost story. There was indeed a whole life that was lived in this space, a life with intrinsic value and worth. And because the original story cannot be recovered, this work also communicates an interesting challenge: Let’s not be careless consumers, too quickly throwing things away just to have something new take its place. Progress is important, but if it is attained through sacrificing an awareness of history and the value of our lives, it amounts to a great loss. The collaborative nature of this work – a hallmark of Volta’s projects and teaching method – is also very important. In the making of this work the stories of the students and the artist are woven together with those of the unknown occupants of the home that was. The distance that stood between them has been bridged by their imagination and creative effort. In the Judeo-Christian tradition all human beings are called ‘image-bearers’ of God. All human stories therefore have an intrinsic value, precious to the Creator. Even though they are temporary in a sense – just as this artwork itself, soon to be demolished with the rest of the building – their worth is eternal. The artwork calls us to remember this truth, in a neighbourhood where this is all too easily forgotten. Ben Volta (1979) has been creating and exhibiting as a professional artist based in Philadelphia for the past 10 years. His individual and collaborative work has a strong graphic element, which also forms the basis for many commissioned projects and installations with young students and organizations. For further information and upcoming projects, see www.benvolta.com. Robb Ludwick (1970) lives and works at L’Abri Fellowship in the Netherlands (www.labri.nl) with his wife and four children. Alongside rendering hospitality and mentoring L’Abri guests, Robb teaches and writes regularly on cultural apologetics and personal spirituality. He holds degrees in literature, pastoral theology and philosophical anthropology.